Make a one time donation or sign up for our automatic monthly donations. All donations are tax deductible. Use this button to make a one time donation. Use this button to set-up a recurring monthly donation for one year. Use this button to stop your montly donation at any time. There are many different ways you can get involved and help animals in our rescue. If you would like to be a volunteer, please email volunteer@LifeIsBetterRescue.org. Have you thought about maybe getting a second dog? Or experiencing the fun of having a litter of orphan kittens (without having to add to the adoptable euthanasia population)? Fostering can be a great opportunity to try having some extra pets without the full commitment. We are in desperate need of homes for kittens and mommy dogs with puppies. If you can open up a spare bathroom, you can change a life. Please contact volunteer@LifeIsBetterRescue.org for more information on how to get involved. 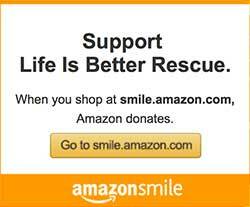 Shop our online store for fabulous gear to let the world know that you support animal rescues. The author of the New York Times Bestselling Author of A Dog's Purpose is teamed with Life is Better Rescue to help needy animals. For the cover price of $22.99 you get a tax deductible receipt for $8.81. There is an additional $4 charge for shipping (but you get one of our fabulous "Best Things in Life" stickers for free!). Have you ever been rescued by a rescue? Sometimes the most wonderful gifts in life are the ones that no one else saw the beauty in. We have created a set of vinyl stickers for use on a car, on a water bottle, notebook, etc. that help spread the message about life being better. The message reads: The Best Things in Life are Rescued. Each sticker is $4 with $1 shipping up to 4 stickers (add a $1 for 5 and a $1 more for each additional 5 stickers). ALL the proceeds go to help animals in need. Every penny makes a real difference. Buy yours today and let the world know that rescued can be the best.